Once an evaluation workflow has been created, evaluation processes can be created based on an evaluation workflow. Existing evaluation processes cannot be associated with evaluation workflows. To associate an evaluation process with an evaluation workflow, the evaluation process must be created based on an evaluation workflow. Click Evaluation Processes in the Evaluations section. The Evaluation Processes screen displays. Click Add. The Evaluation Process Form screen displays. In the Evaluation Process Type section, click Workflow. The screen changes to allow you to select an evaluation workflow. Unit: Select the unit to be associated with the new evaluation process. Title: Type a title for the new evaluation process.The title for an evaluation process should include a related time period and the nature of the evaluation (e.g. 2015 Tenure Review). Description: Type a description of the evaluation process, if desired. Faculty: Click Select Faculty to select the faculty members to be evaluated related to this process. Evaluation Distribution: Specify if the evaluation process is applicable to the faculty members primary unit, secondary unit, or both units (the default is Primary Unit). 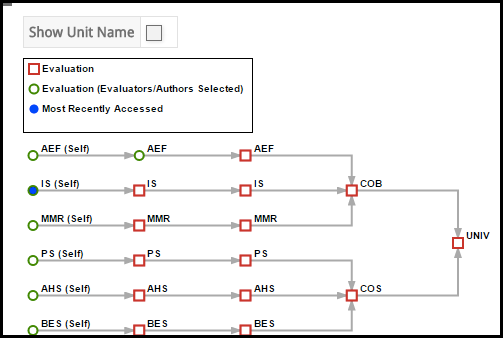 Any custom evaluation forms and faculty classification input forms that are associated with the selected evaluation workflow display here. Begin and End terms can be specified for faculty classification input forms. The Timing Configuration is used to select the start date for the evaluation process. Once a start date is selected, the Due and Faculty Response Due fields will be updated if necessary. When you are finished, click Save and Customize Evaluations. Upon clicking Save and Customize Evaluations, changes cannot be made to an evaluation process. Changes can only be made to individual evaluations. a.Evaluations are created based upon the faculty that were selected and their unit designations. For example, if a step for a department committee was created, an evaluation will not be created for the accounting department if only information systems department faculty are selected. b.Evaluations identified by a red square indicate an evaluator needs assigned to them. c.Evaluations identified by a green circle indicate evaluators/authors have been assigned. d.Evaluations identified by a solid blue circle or square identify the most recently accessed evaluations. Review each level of evaluations and assign evaluators/authors. When finished reviewing, all of the evaluation levels should be represented by a green circle. Click the node adjacent to the desired evaluation. The Evaluation Form screen displays for the selected evaluation. In the Assign Evaluator(s) & Schedule section, click Select Faculty to select the evaluators. If necessary, evaluation authors can also be selected. Faculty who are assigned to an evaluation serve as either an evaluator or an author. Evaluator: Has read-only access only. 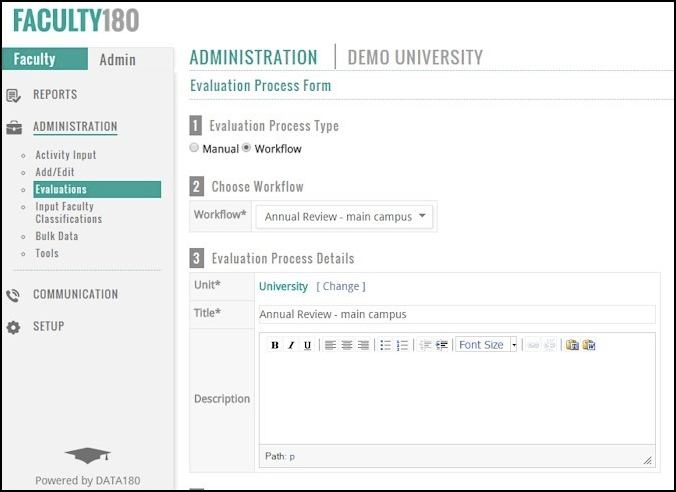 Can view faculty data related to an evaluation but cannot submit a written evaluation. Author: Has read and write access. Responsible for submitting the written evaluation. This person is typically the chair of a committee (e.g., tenure committee) or an administrator (e.g., chair, dean, provost) responsible for completing performance evaluations. 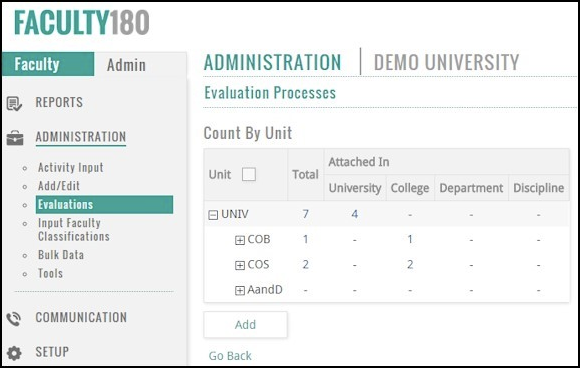 Select the appropriate notification option.This will notify faculty and administrators responsible for managing other levels within this evaluation process. Click Save to save the changes and return to the previous screen. Click Save and Add Another to save the changes and refresh the form to add another, new evaluation. When you are finished assigning evaluators and authors, click Save. Once an evaluation workflow and processes have been created, it is recommended that each individual evaluation that was created through the evaluation workflow/process be reviewed. To review an evaluation, see evaluations.